I finished my tapestry sampler! Alright there were supposed to be several trains, but there were issues with the first one, and the person that requested the tapestry decided that they prefer the periwinkle color to the original indigo. But the sampler is finished! This is my silk and wool batt. 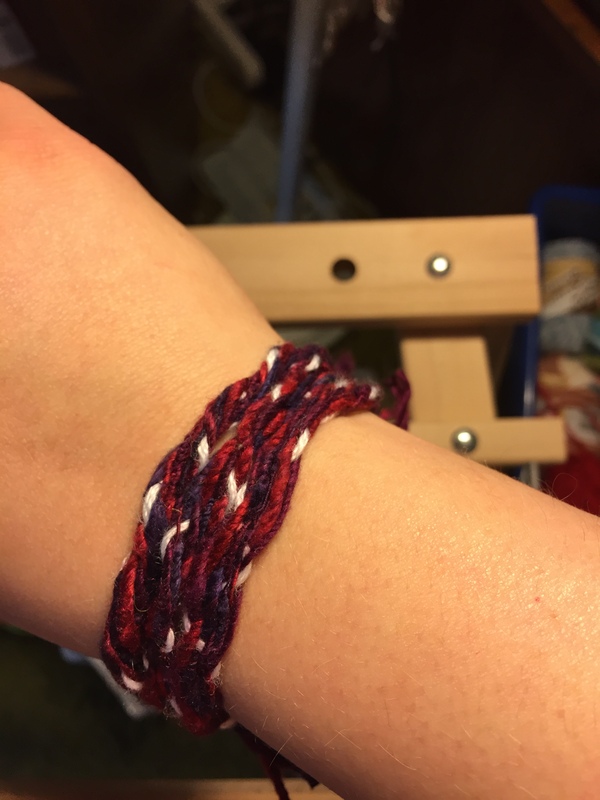 There is a pretty white wool as the base and the colors are all silk. I carded this together and cannot wait to see how it spins up! What a fun week, Happy Crafting! Okay, Okay, so I’m still in my silk mood. I ordered 4oz of Bombyx silk from etsy. It is so much fun to spin, then I might have to see what I can do about dying it. Apparently silk dyes as easily as wool, it should be fascinating to see what colors I can create without losing the luster. I sincerely hope that I will be able to get at least 100 yards of 2 ply silk, but whatever I wind up will should be beautiful. So much fun! On the left is my finished Monet Silk and on the right is some gold silk I had lying around. Both are 2 ply and just beautiful, the camera does not do their luster justice. The Monet wound up being 32 yards and the gold just over 40 yards. I am not sure what I am going to do with them yet though it will have to be something pretty special. I love spinning silk, as soon as I get through this minor bout of obsession I am going to try and translate these skills to spinning my wool with a finer, tighter hand for weaving. A week ago I attended a class on spinning silk with the Enchanted Mountains Weavers Guild in Bradford, PA. It was amazing. I learned about spinning silk from the fold, I sort of knew about that already, and using cowboy magic to keep my hands supple for spinning. I think they use the detangler and shine while I purchased the conditioner. As far as I can tell, since they both have silk proteins in them, mine should work just fine. (It certainly makes the silk slippery enough, lol.) The bobbin on the left is the 1/2 oz sample of silk I purchased to practice with, I’m not sure what the colorway is called but I think it looks like Monet’s “Waterlily Pond” painting myself. I am shocked at how fine I can get my spinning to be when I concentrate and cannot wait to see what this will look like when it is plied! Please excuse the Laundry Basket. This was the only place I could get a really good picture of my Bombyx silk, my bathroom/laundry room. The lighting picked up the purples much better than in the living room. I am very pleased with how this turned out. I purchased Witchy Woman silk from WoolieBullie so that I would have some black silk for autumn rolags I created to prepare for Spinzilla! I love how much silk is in an ounce, so I was able to create this cabled silk yarn, 4 plies total. It is only about 40 yards long but it is beautiful and will create a remarkable project once I decide what I want to do with it. I had some Silk Hankies left from 2012 when I last purchased fiber. I decided to spin them, and while I was on a Navajo Plying kick this past weekend I plied them. 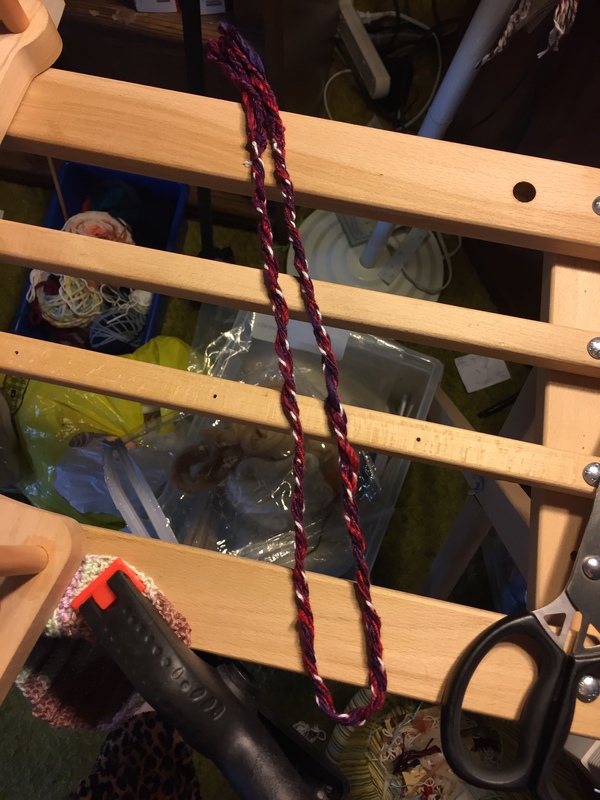 I then decided to exercise my new Inkle Loom, and much to my delight I love the results.